November 25, 2007 – What's Up?! So me and a buddy somehow got on to a discussion about the movie WarGames, and found ourselves disagreeing over the name of the fictional military computer in the movie. I could have swore is was pronounced “womper”, while he disagreed and said it was “whopper”. 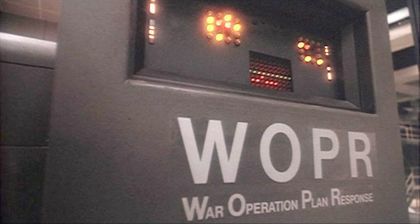 A quick search online revealed that I was in fact wrong, it was pronounced “whopper”, for War Operation Plan Response. Whaddya know!? Though, many people (including myself at that point) do in fact reference it as “womper”, it’s still wrong. Still, I felt certain I didn’t pull that name out of thin air. So I thought maybe from the movie Spies Like Us was a possible source. While I am still unable to confirm it, it doesn’t appear to be so – at least with a short glance. Still, I feel strongly that I’ve heard that somewhere before in a movie, and referencing some sort of system. I may never know.